The average age of the Brooklyn Nets preferred starting lineup right now is 32.4. 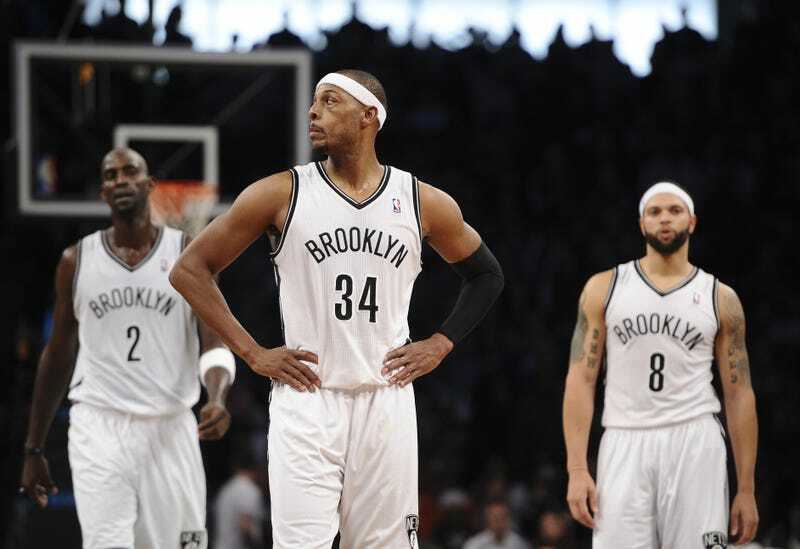 Joe Johnson, Paul Pierce, Kevin Garnett, and Deron Williams have seemingly been in our collective consciousness for decades. Even Shaun Livingston, the fifth member of that quintet, is best known for a gruesome knee injury that occurred over six years ago. Everything about the stars that power the Nets is inherently old. Yet ironically enough, it's this group of geriatrics, not the youthful Suns, stats-crazed Rockets, or star-studded Heat, that is on the verge of setting a new precedent for NBA defenses. When diving into theoretical debates about defensive tactics in basketball, you'll rarely find a bulletproof strategy. If you pack the paint, you protect the basket but concede outside shots. If you pressure opponents, you gamble create turnovers but give up opportunities for easy baskets. Even Thibodeauean defenses overloading the strong side will leave you vulnerable to offenses intent on precise ball movement, like the Spurs, unless you've got a Tony Allen or a LeBron. The list goes on and on. Every scheme based in sound logic and executed to perfection still routinely gives up something to an opponent. When switches work in the NBA, its because of the decisions they force offenses to make on the fly. Opposing ballhandlers need to identify the best approach to attack the swapping of defenders. Sometimes that means having a smaller quicker player attack a bigger opponent. Other times it's throwing the ball to a teammate with a size advantage. But as the margins shrink—a 6'6" player trades out on a high screen with a guy who's 6'8", say—the time to compute where the optimal matchup is now goes up, and all this goes on under the pressure of a descending shot clock. For most teams, adhering to a scheme that calls to switch every player on the floor makes little sense—while the concept of sternly defined positions is fading out, there's still the matter of having the physical tools to defend multiple positions. In theory, though, an NBA organization could construct a roster with one great defensive big man surrounded by interchangeable players at every other position, players who possess the mobility and height not only to switch when necessary, but rotate and recover quickly around the floor. In other words, this hypothetical team would look very similar to this year's Nets. Forced to reconfigure their on-court identity after losing star center Brook Lopez for the season, the Nets decided to go small. Brooklyn moved Garnett to center, Pierce to power forward for the first time in his career, and started a backcourt of Williams, Johnson and, eventually, Livingston. Their reserve unit, always seemingly in flux due to trades or injuries, now includes Marcus Thornton, Andrei Kirilenko (when healthy), and Alan Anderson. The common thread for all these perimeter players is that every single one is at least 6'4", with the exception of Williams, who misses that cut off line by a mere inch but has become, let's say, rather stout. By combining this genetic conformity on the perimeter with the presence of Garnett at center (and to a degree, rookie Mason Plumlee) Brooklyn has achieved the ideal defensive template. Williams may give up size when switching, but his strength makes up for it. Ditto for Johnson, an oversized shooting guard who can make up for height disadvantages in the same way. Livingston's thin frame can make him an easy target for bigger players, but his length allows him to be a pest both on and off the ball. Tying it all together is the sage veteran Pierce. While still at risk of being overpowered by certain power forwards (Zach Randolph in Memphis), Pierce has survived just fine in a smaller Eastern Conference, giving the Nets the ability to swap him onto opposing wings with little risk of being exposed, and he's been a pest for mobile bigs like Chris Bosh, who prefers attacking slower big men. Along the bench, Thornton is still a subpar defender, but at least can't be bullied too easily by bigger opponents in the post. Anderson won't be confused with a lockdown defender either, but can guard both wing positions. Perhaps due to his assortment of injuries of the years, Kirilenko's length can't make up for his diminishing footspeed anymore, but other than when he's match up against quick point guards and bruising centers, he can still be effective. This isn't to say the Nets go crazy with switching. They use it like most teams—late in the shot clock, and a few other select occasions—but they don't just trade off defensive assignments every time an opponent moves would be a disservice. The important thing is that not that Brooklyn leans on the concept, it's that they can do it without putting themselves at a disadvantage. The original intent of the play is to free Korver for a quick catch-and-shoot. Pierce and Kirilenko switch the first screen—something they can do because Pierce can stay with Korver and Kirilenko can guard Millsap if the ball is thrown into the post (the probable counter to a switch). This move forces Korver to make a non-threatening catch and pass the ball back out to teammate Jeff Teague. The Hawks then move into third option on the play (a high pick-and-roll) and the end result is a long 2-point shot from Millsap. This subtle maneuver may not seem like much at first. But when you consider Korver shoots 48.3 percent in catch-and-shoot situations and Millsap shoots only 30.3 percent on long 2s, it created a big advantage in the Nets favor. The Nets were able to keep up with able to keep up with the Heat's pick-and-rolls and ball movement due to their ability to scramble rapidly from action to action—something that teams like Memphis or even Indiana for that matter aren't capable of doing. It finally culminated in a contested Shane Battier 3 from the wing, a positive conclusion when you consider just how fast Miami was whipping the ball around the perimeter. This kind of active, fluid defense results in lots of deflections and steals, and since the start of 2014, Brooklyn ranks 1st in opponent turnover percentage, per NBA.com. More than that, the constant pressure on the ball, and the ability to put versatile players in positions to contest everything, forces Brooklyn opponents into late shot clock attempts on 12.4 percent of all possessions, per Synergy Sports, tied for second in the league. Want to know why that's important? Like most teams, Brooklyn gives up far fewer points late in the clock—77.7 points per 100 possessions, versus 91.8 in regular halfcourt. Brooklyn's ability to force turnovers was already evident in Game 1 against Toronto. Late in the third quarter, with the Nets already in the midst of a run, their switching caused Kyle Lowry problems as he attacked the rim off a screen. Overall, the Raptors turned the ball over 17 times (nine more than Brooklyn) on Saturday thanks to active defense by the Nets. That number will probably come down some, but expect Brooklyn to continue to give the Raptors problems with this look, particularly when it comes to slowing down Demar DeRozan. And so a Brooklyn team with old, marginal defensive talent became a top 10 defensive team after Lopez went down for the season. They're so good that the Garnett-Pierce-Johnson-Livingston-Williams quintet has an absurd 89.9 defensive rating, according to the NBA.com's stats site. The sample size is small—only 129 minutes—but that Nets group has demonstrated the power of a versatile, mobile, defensive unit. And I can't understate how little this successful group has in common with the elite, shut-down perimeter defenders. So if this aging Brooklyn team is doing so well with such a scheme, why hasn't it been done before? The problems with establishing such a unique scheme in the NBA is two-fold. First, is that it's hard to field a rotation full of players that are equal size without making major sacrifices in other areas. The second part is that as the analytics movement has shown us in recent years, big men that are able to hang back and protect the rim are the best path to creating an elite defensive unit. This impact of size is also why teams subscribe to deploying two traditional frontcourt players. Good defensive teams like Memphis, Indiana, San Antonio and Oklahoma City have routinely opted for size up front in and are tough to score on because of it. That doesn't mean a switch-heavy scheme is a risk at the professional level of the game. It just falls against conventional wisdom—which is a tough thing to overcome in the NBA's insulated environment. Teams that can spend their defensive possessions moving quickly to close down open space and swapping defensive assignments are a nightmare to gameplan against. Teams, like the mid-to-late 00s Atlanta Hawks and George Karl's last Nuggets team, have tried with varying degrees of success, but having an anchor in the back who knows where to move and when—a Garnett or Bogut or Duncan—is what can push a team like this over the top. A Nets team that began the year as a fossilizing collection of basketball talent is now poised to upset the established hierarchy in the Eastern Conference. In the process of trying to survive the loss of their star big man, Brooklyn may have discovered a template for how teams in the NBA's new era should structure their defenses. Brett Koremenos is a freelance writer and a basketball trainer and coach. Follow him on Twitter here. The Warriors Might Actually Play Some Offense This Year. Thank God.